A UN panel that on Tuesday ruled that glyphosate was probably not carcinogenic to humans has now become embroiled in a bitter row about potential conflicts of interests. 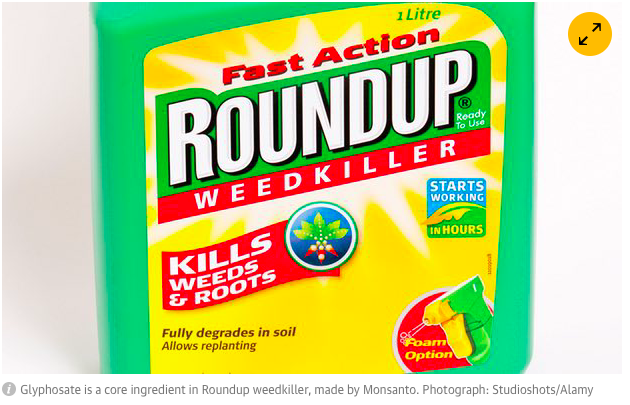 It has emerged that an institute co-run by the chairman of the UN’s joint meeting on pesticide residues (JMPR) received a six-figure donation from Monsanto, which uses the substance as a core ingredient in its bestselling Roundup weedkiller. Professor Alan Boobis, who chaired the UN’s joint FAO/WHO meeting on glyphosate, also works as the vice-president of the International Life Science Institute (ILSI) Europe. The co-chair of the sessions was Professor Angelo Moretto, a board member of ILSI’s Health and Environmental Services Institute, and of its Risk21 steering group too, which Boobis also co-chairs. In 2012, the ILSI group took a $500,000 (£344,234) donation from Monsanto and a $528,500 donation from the industry group Croplife International, which represents Monsanto, Dow, Syngenta and others, according to documents obtained by the US right to know campaign. But the news sparked furious condemnation from green MEPs and NGOs, intensified by the report’s release two days before an EU relicensing vote on glyphosate, which will be worth billions of dollars to industry. The WHO says that from its side, the timing of the report’s release so close to the EU decision was coincidental, and was decided several months ago. The debate over glyphosate, the most widely used herbicide in human history, has become a lightning rod in Brussels, because of its widespread use with crops genetically engineered to resist it. Its use has also been led to reports of associated damage to human health, nearby flora, insects and animals. The debate over the scientific bona fides of the ILSI also has a fractious back story. In 2012, the European parliament suspended funding to the European food safety authority (Efsa) for six months over a string of conflicts of interest allegationsinvolving ILSI members on the board of Efsa and on its committees. The dispute saw the resignation of the chair of the Efsa management board, as well as Moretto standing down as a member of the Efsa pesticides panel, for failing to declare links with the industry and ILSI. An advisory position held by Boobis at Efsa was discontinued in 2012. At that time, ILSI described itself as a “key partner for European industry”, but it now says that it is a non-profit guided by scientific and environmental concerns and that it does not lobby or make policy recommendations. This description of the group was endorsed Dr Philippe Verger, a WHO official and secretary of the UN panel on glyphosate. He said that ILSI could best be called a “meeting place” for scientific discussions. The UN panel’s conflict of interest explainer says that it will exclude experts who have “forms of economic relations that may undermine [their] neutrality”. In common with an Efsa assessment that also attracted anger from environmentalists, the JMPR’s decision was taken on the basis of confidential industry dossiers not available to the public. A separate report last year by the International Agency for Research on Cancer (IARC) – WHO’s cancer agency – which only considered publicly available studies, concluded that glyphosate was probably carcinogenic to humans. But WHO officials maintain there is no contradiction between the two papers, noting that IARC was identifying a potential hazard, whereas the JMPR was quantifying the associated risk. ← Will SUN push its way into India?